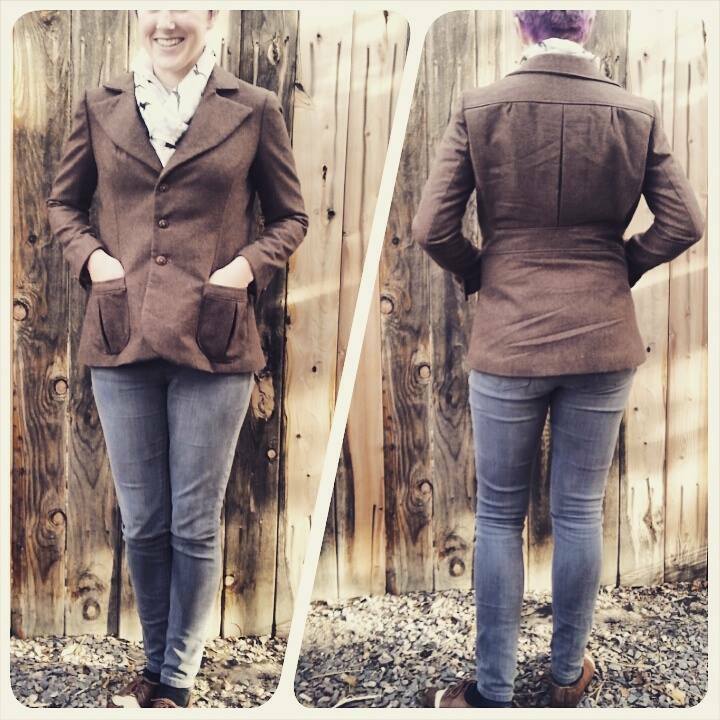 The 10-Day Tailoring Challenge - Completed in 8 Days! Well, here it is, my 1935 jacket, on my body. I'm super proud of this project, even with all the mistakes I made. It's wearable and looks pretty alright (please forgive my car-ride creases in the photo). Now I want to *tailor ALL the things. * I have a couple 1940s repro patterns, and a great 1930s coat pattern from the Vintage Pattern Lending Library just begging to be made up (for a couple years now, in fact). ...but those projects are for when we get back, in 2015. Chris and I are off to spend Christmas and New Year abroad with our family. We've not had a true vacation, and never one together, since we started AmericanDuchess.com back in 2011. This is a much needed break. So with that, Merry Christmas and Happy New Year to all! I love that jacket!! Beautiful job!! Genius that I am, it never occured to me to use a modern pattern with a little vintage one. I am inspired!! Have a very merry Christmas, and enjoy your time together! You deserve it! Thank you! If the vintage pattern had been my size (or close to it), I wouldn't have cross-referenced it with the modern repro, but because it was SO much smaller, I was nervous about my grading, and wanted to just double check. Most of the pieces I'd graded were really close! A hacking coat that looks like it could be RL Purple label. I love the casual but chic look with jeans! That's quite a compliment. Thank you! It looks so spiffy! Have fun on your well-deserved vacation! Oh what fun! A retro jacket that looks smashing enough to wear "Nowen days" as my son says...you look fabulous! Your jacket turned out amazing!!! Please tailor everything now, oh goodness. Have a wonderful and save holiday vacation!! You are a BADASS, and your coat looks awesome. So excellent! I love how you combined eras with the jacket (which looks straight out of a 1930s film) and jeans. Love love love. I hope your trip is/was wonderful!